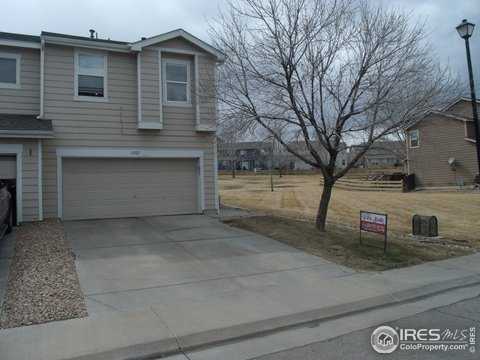 SPACIOUS 4 BEDROOM TOWN HOME OFFERING LOW MAINTENANCE LIVING ! LARGE KITCHEN W/ EAT IN AREA AND ACCESS TO BACK PATIO, GAS FIREPLACE IN GREAT ROOM, LARGE MASTER BEDROOM WITH TWO CLOSETS AND FULL BATH, PLUS 3 ADDITIONAL BEDROOMS UPSTAIRS. SMALL FENCED BACK YARD BACKS TO GREEN BELT FOR YOUR ENJOYMENT. FURNACE, HOT WATER HEATER AND ROOF ALL UPDATED IN 2018. CONVENIENT LOCATION CLOSE TO REC CENTER AND LIGHT RAIL.